Many executives … have gained a better understanding of what UX design and research can do to boost the success of a business offering. An increasing number of organizations and individuals who develop software products, Web applications, Web sites, or other digital products are gaining a better understanding and appreciation for user experience and UX design and research. Subsequent to the introduction of some magnificent products and services that many executives now own or use—such as smartphones, tablets, Web applications, social media, and video games—they have gained a better understanding of what UX design and research can do to boost the success of a business offering. That said, it still seems that the majority of product development organizations and the individuals who work for them have not yet fully bought into the benefits of UX design and even less so of UX research. When you encounter these sorts of organizations or individuals, you have a decision to make: fight or flee. To make a good decision, you should start by identifying the maturity of the organization in which you work. It might be helpful to do this by considering the UX research maturity model I’ll describe in this article. Several maturity models for human-centered design and usability exist in the literature. [1, 2, 3] The UX research maturity model shown in Figure 1 is based on an organization’s level of buy-in for UX research in combination with the presence of UX research staff within an organization. maturity—both buy-in and staff—An organization believes in UX research, fully trusts UX research practice—whether in house or external—and behaves in a manner that is consistent with that belief. These are the rare organizations that truly get it. They have a deep understanding of and appreciation for UX research, and they back it up with action. They ask potential customers all the right questions to understand what they need, and they iterate and validate their designs to perfection. Fight or flee? Neither. You won’t need to fight, and there is no reason to flee. All is well. approaching maturity—buy-in, but no staff—An organization states that UX research is important, but when it comes to action, there is no staff to act upon that policy. An organization may have hired consultants to do some ad hoc research in the past and plans to hire their first full-time user experience researcher or a research team in the near future. Fight or flee? Neither. This type of organization is currently taking baby steps in the right direction. Join this organization when it hires new people or transfer to an internal UX research position if you already work there in a different role. approaching immaturity—no buy-in, but there is staff—An organization employs UX research staff, but does not really buy into what they do, discover, and recommend. This type of organization is probably the hardest for UX researchers and other UX professionals to work in. It’s extremely frustrating for UX professionals to work in an environment that sends contradictory messages. On one hand, the organization appreciates UX design and research because it allocates headcount and hires the right people. On the other hand, it is evident that there is no appreciation for this discipline. The organization makes design decisions based on the wrong considerations, and stakeholders do not empower UX designers and researchers to do their jobs. Fight or flee? To an extent, it’s worthwhile to fight, but if the organization doesn’t mature, flee. immaturity—no buy-in or staff—An organization does not believe in UX research—or has no position regarding research—and does not employ any in-house or external research practitioners. It’s probably easiest to know what to do in this type of organization. As Frank Costanza once said, “If they don’t want me, I don’t want them”—from a Seinfeld episode from 1996, “The Doll.” Such organizations should not—and usually do not—get the attention of UX professionals. Maybe they’ll get it eventually, maybe not. Chances are that they will someday. Until then, it’s a waste of time to even try working with them. Fight or flee? Hopefully, neither. You’re probably not working for one of these organizations. Clients that approach consultancies are already persuaded that user-centered design is what they need…. Many consultants have the privilege of choosing their clients, deciding whether to work with certain clients and stakeholders. In many cases, clients that approach consultancies are already persuaded that user-centered design is what they need, so consultants need not make a big effort to persuade them to buy into UX research. In his article, “Why I Can’t Convince Executives to Invest in UX (And Neither Can You,” Jared Spool speaks about this reality. As does Donna Spencer, in my interview with her, shown in Figure 2. They don’t try to convince those who can’t be convinced. The world is not so simple that all organizations conform to just four types of organizational maturity. There are definitely other situations, complications, and types of organizations. What about organizations that have never believed in UX research and design or had any UX staff, then suddenly start becoming interested? What about agencies, consultancies, and self-employed UX professionals who deal with organizations in which there are not many opportunities to fight, so it’s better to flee? What about government agencies that follow strict procedures? They may have bought into UX research, but have procedures that force them to behave counterproductively. The world is not so simple that all organizations conform to just four types of organizational maturity. 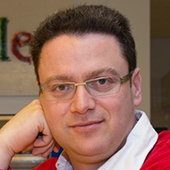 In my interview with Jared Spool, CEO and founding principal at UIE, he claims that there is no point in working with unengaged stakeholders. He suggests that we find better ones. My general advice is this: Fighting all the time isn’t worth it. 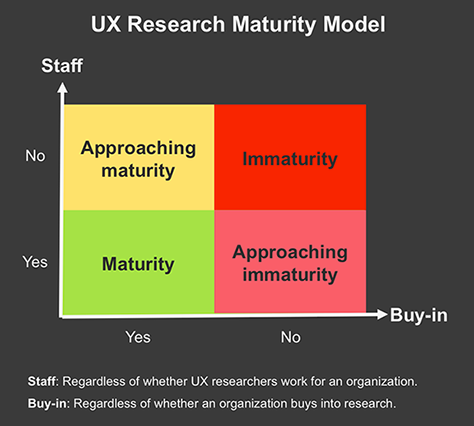 Carefully assess your organization’s level of UX research maturity. It can be a rush to join an organization as an agent of change, but if change consistently gets blocked, you need to consider whether you should stay. If you work as an in-house UX professional and you have had enough of trying to educate your organization, you always have the option to become an independent consultant or join a consultancy or agency. All of the consultants that I interviewed for my book testified that their clients had already bought into UX design and research before they began working with them. So selling UX was like preaching to the choir. However, if you choose to work as an in-house UX professional, you may sometimes have tough choices to make. Consider your situation and recognize your organization’s current level of maturity, then make a thoughtful call about whether to fight or flee. If you work as a consultant and are considering switching to working in house, you need to be aware of and watch for the signs that an organization buys into UX research and design during your hiring process. Do you face interesting, difficult situations regarding UX design or research buy-in that you’d like to discuss? Please share them in the comments below. Of course, you should carefully consider what you choose to share. Earthy, Jonathan. “Usability Maturity Model: Human-Centredness Scale.”PDF INUSE Deliverable D5.1.4s, December 27, 1998. Retrieved September 12, 2011. Nielsen, Jakob. “Corporate Usability Maturity: Stages 1-4.” Alertbox, April 24, 2006. Retrieved September 12, 2011. Nielsen, Jakob. “Corporate Usability Maturity: Stages 5-8.” Alertbox, May 1, 2006. Retrieved September 12, 2011. Approaching maturity—inconsistent buy-in and there is staff—An organization states that UX research is important, but when it comes to action, the organization does not really buy into what they do, discover, and recommend. On one hand, the organization appreciates UX design and research because it allocates headcount and hires the right people. On the other hand, it is evident that there is no appreciation for this discipline on a consistent basis across the organization. The organization often makes design decisions based on the wrong considerations and stakeholders do not empower UX designers and researchers’ doing the full breadth of activities and skills to do their jobs. This type of organization is currently taking baby steps in the right direction.